There are some situations where a central air conditioning unit is not practical and for some, it simply isn’t affordable either. So does that mean you can’t enjoy some good cool air conditioning in the warmer months? That’s not the case at all since there are many excellent and affordable sliding window air conditioner models available in the home marketplace. These easy to install and uninstall vertical window air conditioners work great for those who don’t need an air conditioning unit year round or have budget restrictions that keep them from moving up to larger size air conditioning systems. Sliding window air conditioners (or casement ac units as they are sometimes called) have been around for many years now. These window sized air conditioning units are available in all different price ranges, sizes, and working capabilities. In this article, we will take a look at some of the best sliding window air conditioners in the marketplace. We will also point out what features to look for in a casement air conditioner when shopping around for one. All of this is to help you find the top sliding window air conditioner to help you get some quick relief from the heat in the warmer months of the year. COOLS : 150 sq. 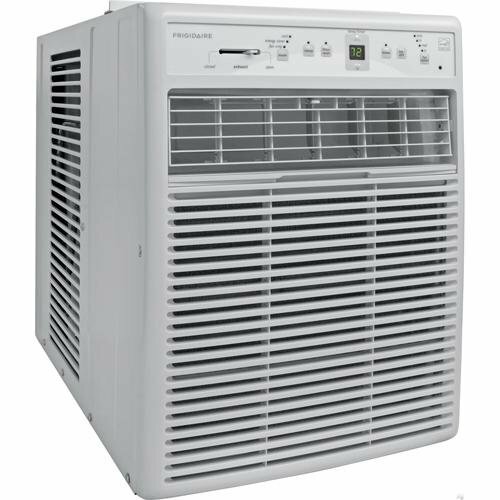 ft.
DIMENSIONS : 23.5 x 14.5 x 20.2"
DIMENSIONS : 14.2 x 23.5 x 20.2"
DIMENSIONS : 23.5 x 14.5 x 20.5"
Here is a nice little compact sliding window air conditioner from home. It comes with 5000 BTU cooling power that works great for cooling an averaged size bedroom or any other type of small living space that is less than 150 sq. ft. Best of all it has simple to operate mechanical controls and is very easy to install on just about any size sliding window. This hOme compact casement ac even has seven different speeds it can be run on. It comes with both an included installation kit and washable mesh filter too. This 5000 BTU sliding window air conditioner is perfect for RV use too. Are you looking for an inexpensive way to cool your small apartment, a single bedroom or an office in your detached garage? 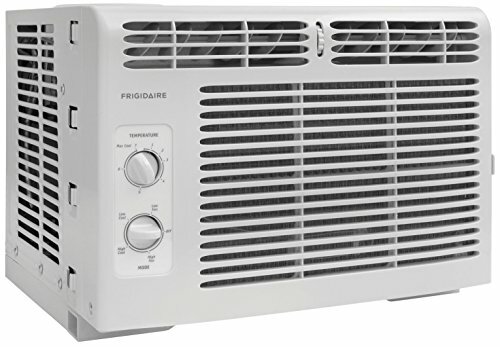 Than this inexpensive model sliding window air conditioner from the reputable Frigidaire can certainly help with that. It’s fairly lightweight and simple to install in just about any size casement window. At 5,000 BTU’s of cooling power, it’s not built for large size spaces but it can easily handle the cooling needs of a normal size bedroom or other mid-size rooms (up to 150 sq. ft.). It will even help dehumidify any room that it’s placed in also. Its simple mechanical controls make it very easy to operate too. Not good for rooms larger than 150 sq. ft. If there is a company that knows all about making your life a little ‘cooler’ it’s definitely Frigidaire. This is a very nice sliding window air conditioner unit that they have designed here. Its 10,000 BTU cooling power can handle a wide variety of cooling tasks very efficiently in living spaces that are 450 sq. ft. or less. There is just much to like about this Frigidaire window ac unit. It can be controlled by its soft-touch push buttons or the convenient remote control that comes with it. There are four built-in fan speeds and this unit will also help dehumidify the air in a room as it runs. It has a large size mesh air filter that is completely washable too. Here’s another fine sliding window air conditioner from Frigidaire. 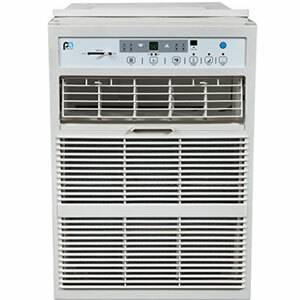 This is a medium powered model that features 8000 BTU’s of cooling power. That is plenty enough for a small apartment, small house or any other space that is less than 350 sq. Ft. The Frigidaire FFRS0822S1 will even help dehumidify the air in the rooms that it cools. This model casement air conditioner features both push button and full remote control operating options. It has 3 different airspeed selections and a washable mesh filter that will help trap dirt and bacteria. 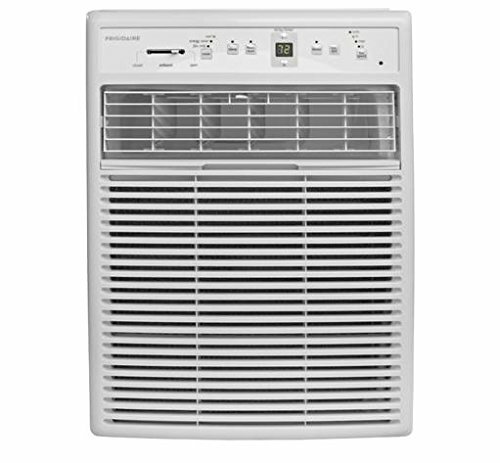 This Frigidaire sliding window air conditioner is also fairly efficient for the type of air conditioning unit it is. It’s rated at a very good 10.9 EER too. 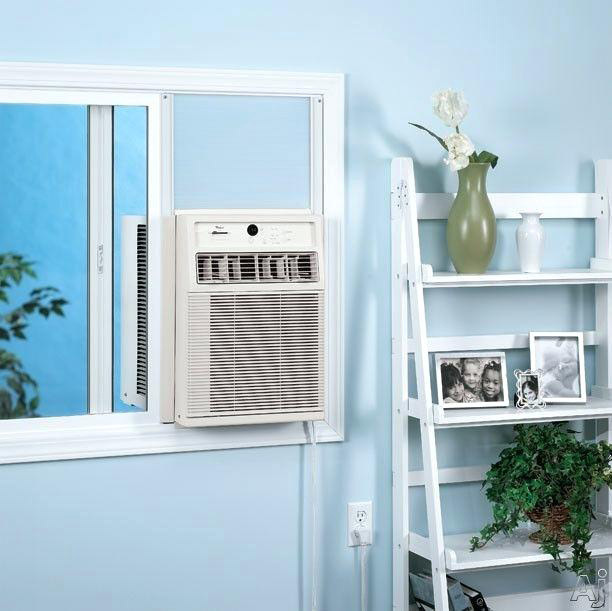 This 10,000 BTU casement slider window air conditioner from PerfectAire can be used with every window type, from casement to horizontal sliding. The temperature settings of this device range from 62°F – 86°F (17°C – 30°C) and are guided by electronic controls and full-range air direction control. 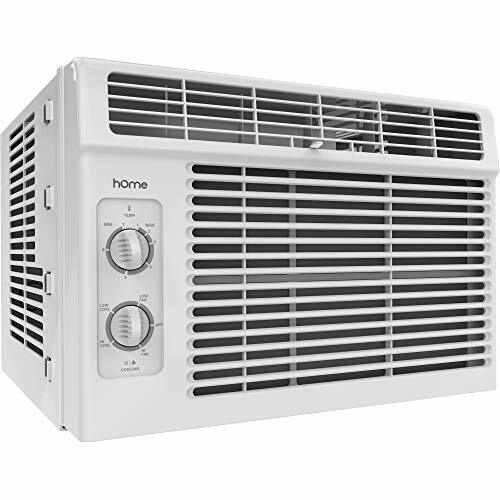 But that’s not all – this PerfectAire 3PASC10000 Window Air Conditioner will bless you with its three fan speeds in both cooling and fan modes. There are a lot of pros and cons of this particular product. The fact that it can cool areas up to 450 square feet and for total room coverage you could use the full function remote control with the Follow Me portable thermostat technology is remarkable. The installation is easy and the device has a tilt-out air filter access so that the cleaning could be easier. However, there are some cons such as the fact that the device could be a bit loud and the price may seem a little too high. 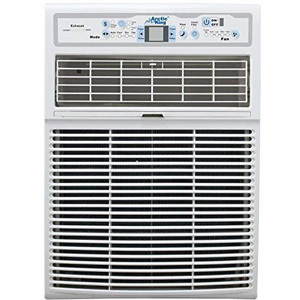 If you have a small to a mid-size apartment that needs cooling or a very big room this sliding window air conditioner from Arctic king can easily handle it for you. It has a good size 8000 BTU cooling power. That Energy Star compliant room air conditioner provides enough cooling for over 250 sq. ft. of space. This is a fancy model vertical window air conditioner too that checks all the boxes as far as sliding window air conditioners go. It can be operated by both push button and remote controls. It even has timed modes so you can set it to come on and off when you like. The Arctic King EWL08CRN1BJ9 also has three fan speeds and its long life filters can be washed too. The most important factor when searching for any vertical window air conditioner is the amount of cooling power it’s capable of producing. This number is always visible on a bright yellow sticker that is required to be on any casement ac model and it’s expressed in what is called BTU’s (British Thermal Units). The higher the BTU rating a sliding window air conditioner has the bigger size space it can cool. When you look at the chart above keep in mind that this is only approximate BTU recommendations and your situation may be different based on other factors. Notice that the chart recommends you get a higher BTU casement window air conditioner if you are putting it in a room that gets full sun all day or you are using it to cool your kitchen. When you are factoring the amount of BTU’s that your new vertical window air conditioner should have you also want to err on the conservative side. That means to choose the higher BTU unit if your calculations fall at the high end of one BTU air conditioning sliding window model and the lower end of another casement window air conditioner. It’s always better to have too many BTU’s than it is to have too few BTU’s in your new sliding window ac. Also, keep in mind as you go up in BTU size you might be better off comparing prices with much more efficient cooling central air conditioning systems. This is especially true if you are trying to cool multiple rooms instead of just one big open area. You also have to remember when shopping for a new sliding window air conditioner you will have to know the maximum air conditioner size that your casement window will allow. That means if your sliding window will open up to 24” inches in height then you certainly can’t buy a new air conditioner that needs a 26” opening height in order for it too fit. So before you start shopping you need to open your casement window as far as it will go and then measure the width and height of that opening. Failure to do this can result in you purchasing a new sliding window air conditioner that will not fit the window you wanted to put it in. Window air conditioners can be pretty heavy. The general rule is the more BTU’s they have the heavier they will be. You need to consider this for such things as ease of installation. Chances are you will not be able to install an air conditioner above 8000 BTU’s yourself. So if you only use your sliding window ac a few months of the year then you may want to consider buying two lighter model units as opposed to one big one. The location where your new casement air conditioner will go kind of goes hand in hand with size and weight. If you are using it to cool a second story bedroom you are going to have problems installing and supporting a bigger window air conditioning unit. So consider location too when you are making your new vertical window air conditioner purchasing decision. Some model casement air conditioners have very good filters. They will help filter dust and allergens and bacteria out of the air that is cooled and then blown into your home. Many newer model sliding window air conditioners even have long-lasting filters that you can wash.
For years sliding window air conditioners only had simple mechanical controls but that is no longer the case. These days you have a variety of control options when it comes to casement air conditioning units. Some still come with simple mechanical controls but others have push-button controls, digital readouts and can even be controlled remotely too. Just like every vertical window air conditioner has a BTU rating on a sticker placed on it that yellow sticker will also contain its energy efficient rating (EER). The higher the EER number the less you will pay to cool your house using that air conditioner model as opposed to others with identical BTU’s. It’s nice to have at least 3 or 4 different airflow speed choices with any window air conditioner you will buy. This is especially true at night because lower airspeeds tend to be quieter. These days there are also many timed and programmable functions built into casement ac units. It makes it nice because you can program your sliding window air conditioner to come on just before you get home or turn off once you fall asleep. Although as we mentioned casement air conditioners are not very expensive, you still want to get the best warranty possible with them. They are not exactly what you would consider a disposable item. Get a warranty that covers as much of the ac unit as possible for as long a time period as possible too. Installation is pretty straightforward for most sliding window air conditioners if you know the size of your window opening before purchasing one and then buy accordingly. It’s best to install each window air conditioner you buy with at least the help of one other person. This is especially true with higher BTU models because they can be bulky and heavy. Open your window as wide as possible. Place the sliding window air conditioner on the bottom of the window. Slide the window down until it makes contact with the air conditioning unit. Level the casement air conditioner using shims. You want it to have a slight lean down toward the outside so it drains properly. Add the installation hardware that helps support it and seal around the window. You may have to do some improvised sealing yourself to get rid of all the air gaps found around the window. Add additional outside support brackets for very heavy sliding window air conditioners. Plug the unit into the nearest outlet. Your new casement window air conditioner is not ready to help keep you cool during the hotter months of the year. Question: The window I want to put my new sliding window air conditioner in, is not near an outlet. Can I use an extension cord to run it? Answer: The answer here is a big fat no!! We cannot emphasize it enough. Sliding window air conditioners that are run on extension cords will build up the heat in that extension cord and can be a potential fire hazard. Choose another window to put your casement air conditioner in that is near an outlet or have an electrician install a new outlet near where your new air conditioner is going to go. Question: I want to use a sliding window air conditioner to cool my small 280 sq. ft. apartment. Should I get a 5000 BTU unit so I save a little money on energy costs? Answer: Negative!! 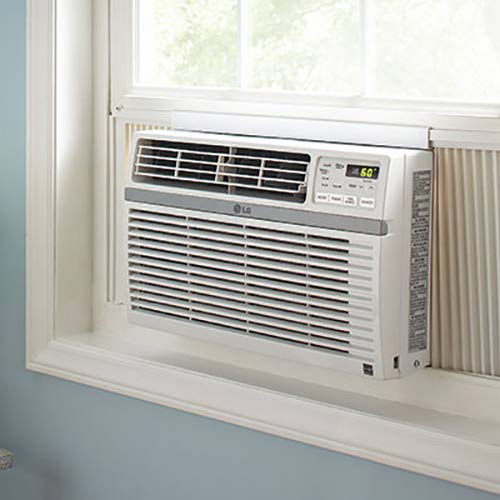 The proper size unit for that size apartment is a 7000 BTU sliding window air conditioner. You will end up spending more money on cooling bills because you will be doing a very inefficient job of it by using a smaller BTU air conditioner than that size space calls for. Are you looking for an air conditioner with Wifi capabilities? What about the smartest window air conditioner you can buy? 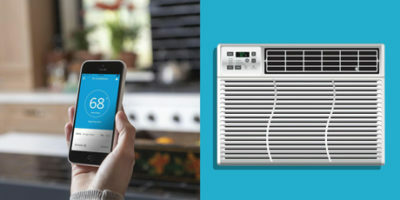 We’ve compiled several WiFi Smart Air conditioners that we think it will answer your questions. 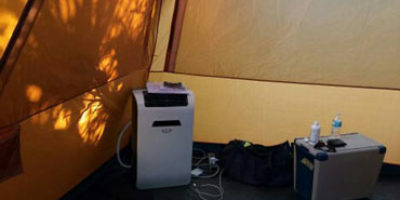 If you are a renter or just want to move it around from room to room, a portable air conditioner might be the best choice for you. There truly is a huge selection of sliding window air conditioner units in the home marketplace. That means everyone should be able to find a vertical window air conditioner that meets their needs and their budget. There is no longer ever a need to be without air conditioning in the hotter months of the year. Use the casement ac reviews we did here as a guideline to what the top window air conditioning units perform like. The buying guide we did here is full of useful information and buying tips too. Use the information contained in this article to help you find the absolute best sliding window air conditioner for your needs.